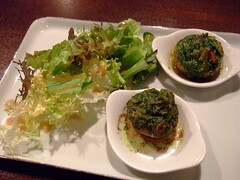 Escargot stuffed mushroom gratin with salad. Duck confit with sauteed shiitake mushroom and potato. 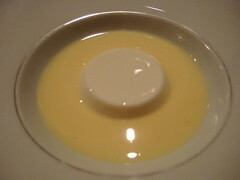 Blanc Manger in Anglaise sauce. 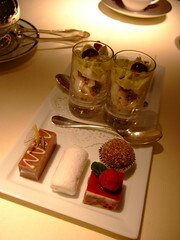 All the above are from the 4000 yen dinner course which includes 2 appetizers, 1 main dish and dessert. Went on a Sunday evening and we were the only customer throughout the whole night. I read from some food blogs beforehand that it’ll get quite expensive if you order from the a la carte, and the set course is of better value. So even though the waiter was a little overly eager to recommend us the a la carte and even said that “the set course might be a bit small in portion”, we ordered the set course anyway. And he was not lying, the portion was a little small. 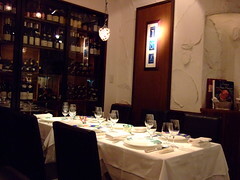 The taste was not bad in general, considering the price, but the service was kinda spotty – there weren’t that many options to choose from the set course and not all of us could choose what we wanted because they could only provide limited portions for each choice. After some compromising among us and we had decided our choices, they told us that they had mistaken the number of available portions, and such confusion happened not just once but twice…. 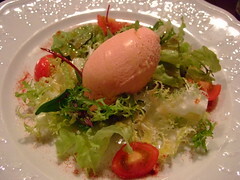 From 5250yen lunch course. 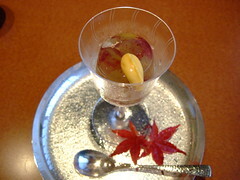 Umeshu(Sour plum wine) included in the course. 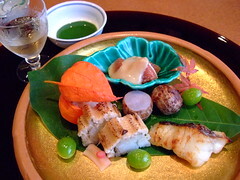 Fig with goma(sesame) sauce, ginnan(ginkgo nuts), hamo no ko(roe of hamo) inside the orange leave, satoimo(taro), suzuki(eat with green sauce), anago sushi. The last three items are warm. 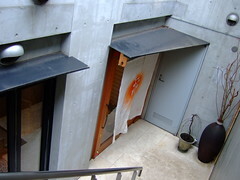 Hamo and atsuage. I’ve tried hamo a few times before and I never thought it was anything special, but after trying the hamo in this restaurant, I realised I just never had a good one before! 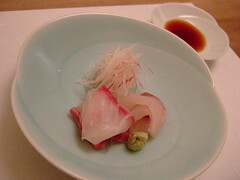 Makogarei and Maguro. 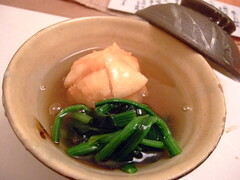 Eat with either ponzu or soy sauce. 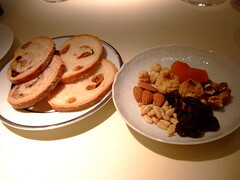 The brown-ish cube is kanten jelly with seeds. 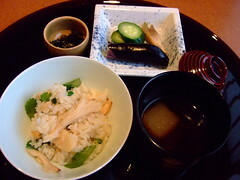 Aubergine and pumpkin takiawase. It is so simple but so delicious. 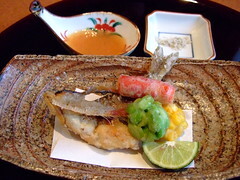 Fried ayu was great but the fried pepper, edamame and corn were truly outstanding. 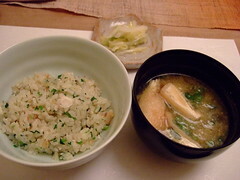 Maitake mushroom takikomi gohan. 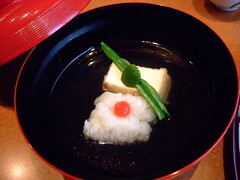 Miso soup with winter melon. Kyohou grape jelly. So nice! 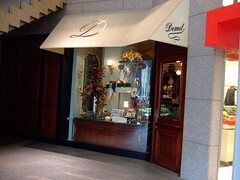 Demel’s cafe in Omotesando. I got really interested after reading potatomato’s post here. 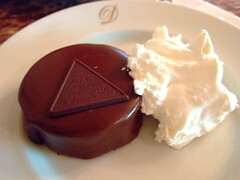 Of course I had to try Sachertorte, which err…turned out to be hard and dry and unbearably sweet…. Anna Torte: The Hazelnut and chocolate cream layer on top is again too sweet but the orange-flavour sponge cake is pretty nice. Truffle Torte: This is the least sweet amongst the three we had ordered. Like my friend said, it is basically a giant truffle chocolate. 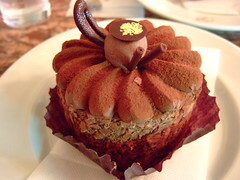 ^^;; The chocolate sponge and ganache give it a soft texture which I quite like. 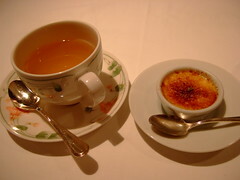 Coffee is very nice too – very very bitter which is perfect to go with super sweet cakes. 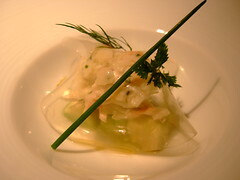 Taraba crab meat and avocado with ham-flavour jelly. Salade de légumes printaniers au calamar et au rouget sautés, puree d’olives aux herbes. Carré d’agneau rôti au thym, galette de pommes de terre au Gruyère. 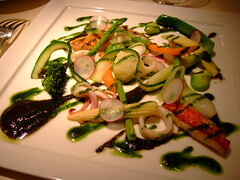 Warm salad of spring vegetables, squid, rouget(grilled fish, only two tiny pieces though). The lamb was soft but the expected nice smell of roasted meat wasn’t present for some reason. Polenta with orange sauce on top was nice though. The staff brought the cheese wagon after the main dish and since we were not full and still had some wine left so we ordered some. 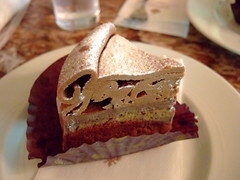 “Mille-feuille” de mousse a l’orange glacée, savarin au chocolat. 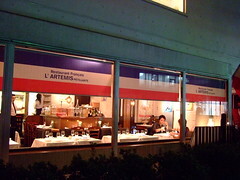 Lunch was 6300yen(a cheaper 4200yen lunch was also available but the menu didn’t appeal to us) plus 15% service charge. 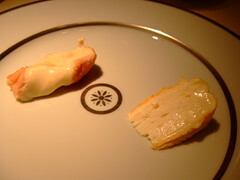 Had a glass of wine, and cheese, came up to about 11,000yen. Food is okay….a bit bland-tasting overall, and the portion is small. 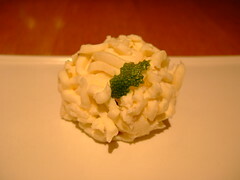 Petit fours looked great but tasted disappointing. 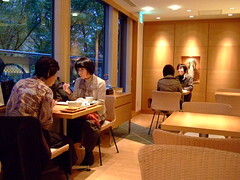 Very nice environment though, with window seats overlooking a park. 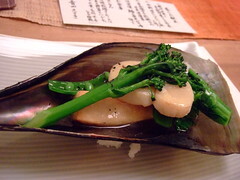 Taira-gai(Fan shell) and seasonal vegetables. 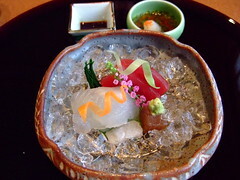 Sashimi from fish caught in the morning. 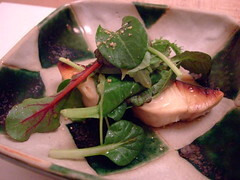 Yurine(lily root) wrapped in senbei, with spinach. Rice with cresson(watercress) and fish. 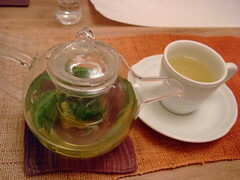 Herb tea. 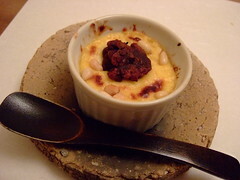 Custard gratin with red bean. 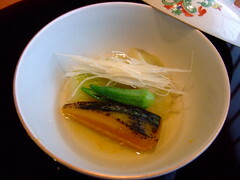 From the 5250yen lunch course. The cheaper 3645yen course doesn’t include “Yurine wrapped in senbei”, but the rest is the same. Everything is delicious and you can really tell the high-quality of each ingredient. At first I was pleasantly surprised by the large portion(for a high-class washoku place), but unfortunately the Taira-gai appetizer was the only item that was in generous portion – the sashimi was tiny(though very fresh), the rice didn’t fill half of the bowl and not refillable(though absolutely delicious), and the size of the dessert made my friend laugh…..I didn’t drink but my friend did and all the Nihonshu options on the menu were quite expensive. Good food but not the best bargain in town. 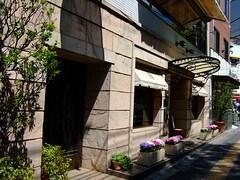 I guess the posh location contributes to the price too – the restaurant is somewhere between Omotesando station and Gaienmae station. We booked a few weeks in advance so we got the private room to ourselves, which is very nice. Try to avoid the table seats cos they don’t look so comfortable. Also an English review here. 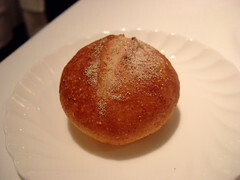 Cream cheese “Kinto” with red bean paste inside. 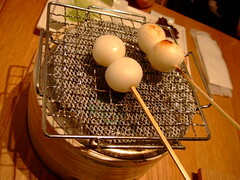 Amiyaki Dango: grilled Japanese rice dumpling(you do it yourself). 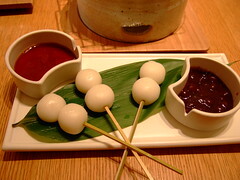 Dipped in sweet soy sauce or red bean. Both of the sweets are good. 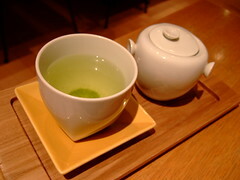 Japanese green tea is about 500yen and you can ask for hot-water refill and sit there for hours. 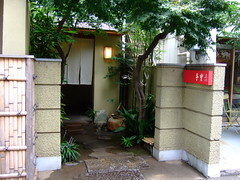 This cafe is produced by a traditional Japanese wagashi shop. 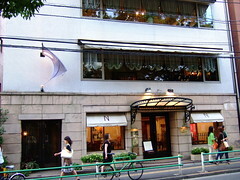 R style is on the top floor of Omotesando Hills. 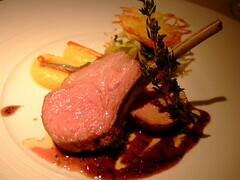 5250yen 4-course dinner has the choice of either: 2 appetizers+main+dessert, or appetizer+fish+meat+dessert. I had the later. 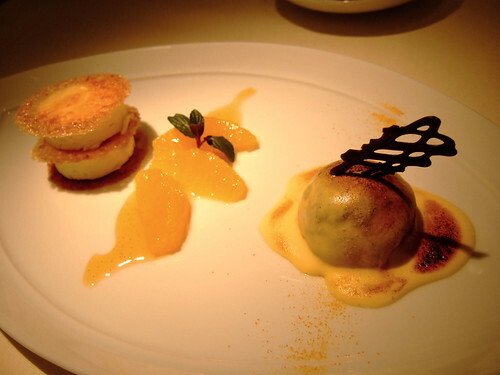 There is also a 3990yen course which is the basic 3-course meal: 1 appetizer, 1 main and 1 dessert. 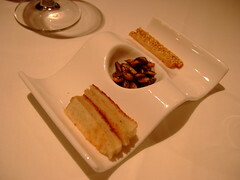 The portion for each dish is slightly bigger for the 3 course dinner compared to the 4-course one. 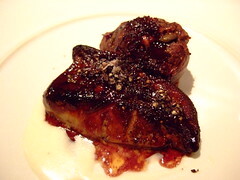 Foie gras and roasted fig(+630yen). 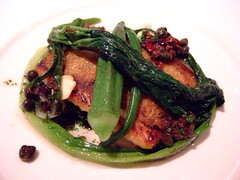 Pan-fried “karei” flat fish, roasted aubergine, sherry vinegar and caper sauce. 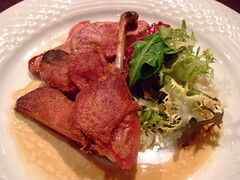 Grilled baby duck with hazelnut(+630yen). 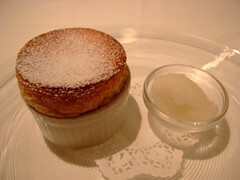 Pear Souffle and pear sorbet. The food is not impressive but not bad in general. 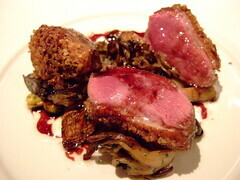 The roasted fig is really nice though the duck could be better. 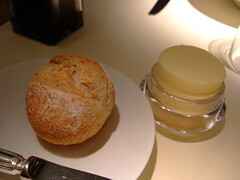 Many of the tempting choices in the menu have additional charges, like the foie gras and the duck. But the boring-sounding options without additional charges actually look good too so maybe it is best to stick to the basic options for better value. Tax is included and the service charge is 7%. Unfortunately the service is far from great – try to get the manager to explain the menu cos the waitress is not so helpful. Glass wine is less 800~900yen. 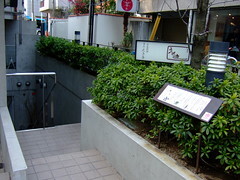 Location is a bit inconvenient – about 10 mins from Harajuku station if you don’t get lost. 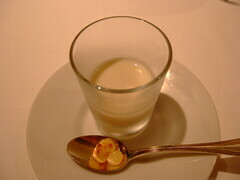 Menu(J): 1, 2, 3, 4.